Dark Angels: 1 Section, 4th Squad (Tactical), 2nd Octavius Crusade Company. | Azazel's Bitz Box. Dark Angels: 1 Section, 4th Squad (Tactical), 2nd Octavius Crusade Company. After a bit of a delay (lots of Diablo III recently!) 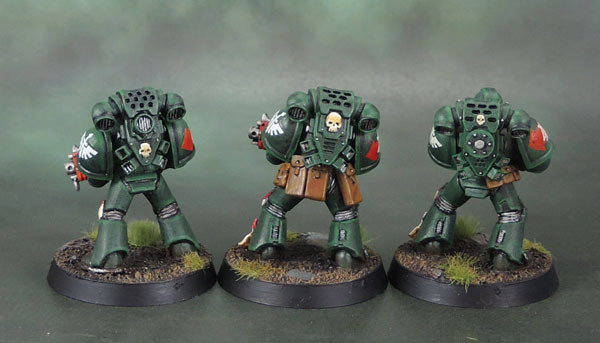 I’ve finally completed the Dark Angels Veteran Sergeant figure, thus completing 1 Section, and therefore 4th Squad. As you can see, I’ve opted for dark green robes with a deep red inner. I never liked it when GW changed that element of their DA scheme from dark green robes to bone coloured ones – so I’m simply ignoring it and painting them my way, but in more of a black-green with a desaturated highlight to help distinguish them visually from the armour. He is one hell of a fiddly figure. While the robes are simple enough, he’s just dripping with extra details, sculpted rather finely as well. This is a figure I picked up a few years ago, rather than having purchased at release. His base tab seems to say “GW01” but 2001 seems a bit old for this model, and he’s not in any of the catalogues I can find over at Stuff of Legends until 2010 – though there’s only abiout thee useful catalogues there covering figures in the Noughties. Maybe the sculptor had a dyslexic moment, or perhaps it was sculpted for some time before being released. I don’t recognise the sculptor, either – perhaps Diaz? That’s something you could do with hand-sculpted metal figures, and as much as I enjoy the new digitally-sculpted plastics, it’s a nice little thing to be able to look at a model and recognise who the sculptor was. Something still very possible with smaller companies, of course. EDIT: Thanks to Alex informing me via the comments, the figure is Dark Angels Veteran Sergeant 1, and was released in 2004. That’s a decent amount of time from the date on the Tab to release, but as we know, it happens. 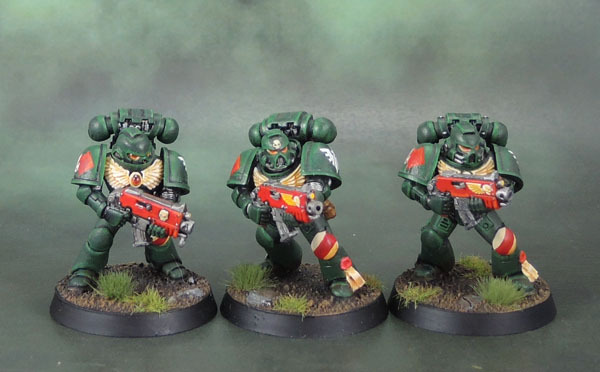 Two of these three are simply plastic 3rd edition marines (with a few pouches added), while their squadmate is the metal MKVIII model with plastic arms. He’s here essentially because of the Sergeant in MKVIII armour that I used in the other squad. It only took 20+ years for us to get the DeathWatch models in proper, multipart MKVIII armour, but I’m sure a few of those could be built and incorporated easily into regular marine squads. Hm…. And here’s the back of them. And here’s the entire squad, finally complete with both sections fully manned now that I’ve finished their new Sergeant. 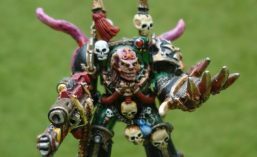 This entry was posted in 40k, Dark Angels and tagged 40k Second Edition, Dark Angels, Space Marines, Tactical Squad, Warhammer 40000, Warhammer 40k. Bookmark the permalink. ← WAAAAGH! 40k Ork Slugga Boyz. Cheers Alex. I’ll add that into the post! I don’t think I’ve mentioned this before, but I really like the background you use for these images too. Simple and effective. Thanks Dave. They’re simply a google of “photo background” and then printed on A3 paper. I’d like to get some nicer ones, printed on cloth or neoprene or some other light, flexible material, but no luck with that so far. Very nice. 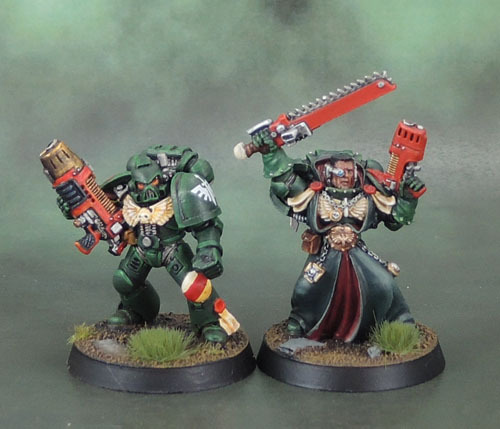 Love that old plasma gunner figure and I strongly approve the choice to paint the robes green; it looks much better than bone I must agree with you. Thanks mate. That influence comes from the old artowkr, and particularly from McVey diorama with Jes Goodwin’s Azrael and the Watcher In The Dark. Some bone robes might sneak in as a homage to the Mark Gibbons Ezekiel artwork, but most will be dark green. I’ve never been able to accept bone robes as “correct”. That is one awesome looking squad! Cheers, Luke. I’ll have some army shots up sooner or later! Some lovely work there sir! Totally took me back to my early days as a gamer with these ‘ere DA’s. I also like the fact that you’ve gone with the dark green robes vs. the cream color as it retains that mysterious not-quite-always-abiding-by-the-rules feel I always thought this chapter had. nice one! Thanks Paul. The hope is that once the force is fleshed out to a reasonable degree that it contains a pleasing mix of old and new and FW-retro. Pingback: Minotaurs Space Marines – Apothecary Heliodorus (2e, 1995) | Azazel's Bitz Box. 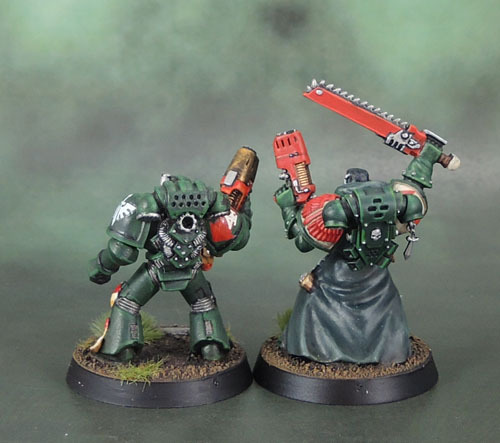 Pingback: Dark Angels Asmodai, Interrogator-Chaplain (2nd Edition) | Azazel's Bitz Box. Pingback: Some notes on painting the models #1: Spraying (A response to Tool Tips 09 – Paints) | Azazel's Bitz Box.